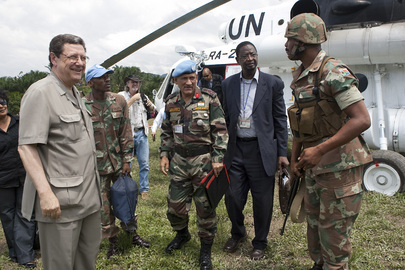 UNITED NATIONS, June 30 -- Amid reports from the Democratic Republic of the Congo of the FDLR rebels rampaging in the Kivus, the Lord's Resistance Army killing and kidnapping and the UN collaborating, at least indirectly, with indicted war criminal Jean-Bosco Ntaganda, the UN's envoy to the Great Lakes Olusegun Obasanjo answered a half dozen questions from Inner City Press on this topics on Tuesday. Inner City Press asked him if he is involved in talks to relocate Bosco's former boss Laurent Nkunda from house arrest in Rwanda to a third country. Obasanjo laughed. "You seem to be leading the minds of the two leaders," he said. "You are close to what they are thinking." Video here, from Minute 12:21. Also being considered for relocation, according to Obansanjo, are some 1500 fighters from the FDLR. 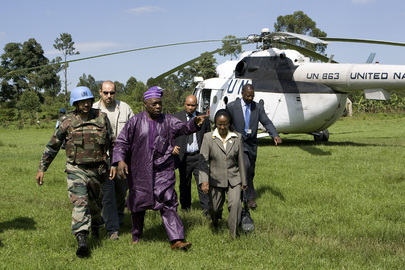 Obasanjo said they could be moved further away from Rwanda. Inner City Press asked, inside the DRC? Yes, Obansanjo said. But who would take them? Who would want a known militia group? Video here from Minute 11:54. Obasanjo replied that they would not have guns. Then again, those are not necessarily difficult to find. Inner City Press asked Obasanjo about the UN ending the Lord's Resistance Army mandate of former president of Mozambique Chissano. Obansanjo appeared surprised that it is ending, and said that all mandates can be renewed. Video here from Minute 9:16. But this one seems over: Chissano has moved on. And what plan does the UN have? Obasanjo acknowledged that Bosco is "not out of circulation." Inner City Press asked Secretary General Ban Ki-moon's spokesperson Michele Montas, in light of a damning op-ed in the Washington Post, what the UN is doing to ensure that it does not work even indirectly with the indicted war criminal, and even helps apprehend him. That is the job of the Congolese authorities, Ms. Montas said. Over whom the UN, after spending billions of dollars, have no say? Footnote: Obasanjo referred to a joint Rwandan - Congolese methane gas project in Lake Kivu. As Inner City Press previously reported, contracting issues have dogged Obasanjo since his tenure in Nigeria. But we can return to that topic in the future. On Tuesday, he spoke more clearly about the Congo than anyone else at the UN.